Why do authors make their books available for free? Among the indies, it’s a common practice to bring our work to a wider readership. In my case, I want to get as many people to read my work as I can, and when I offer one of the Woern Chronicles for free, it brings more readers to the series. One passage had me absolutely bawling…and I mean, shaking and blubbering with grief even though I KNEW none of it was real or actually happening. As an author, you know you’ve succeeded when you’ve made someone cry. But any review that makes thoughtful observations means a lot to me. 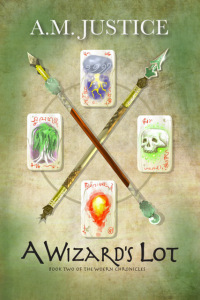 So please download your free copy of A Wizard’s Lot from Smashwords, Kobo, iTunes, Amazon, or B&N, and let me know what you think. P.S. Check out the special offer on the Registry of Citizens page. During the month of October, everyone who provides his or her email address will be entered in a drawing to receive signed copies of both Blade of Amber and A Wizard’s Lot, along with a $10 gift certificate for Amazon.